Do you ever wish you could take some classes to improve your crafty skills, but can't seem to find time in your busy schedule to do it? If this describes your situation, then you'll be thrilled to find out about an awesome site called "Craftsy"! I discovered it awhile back and was amazed at all the great classes they offer at such reasonable prices (some are even FREE!). You take the classes online, in your spare time and on your own schedule! For me, this is the perfect solution, as I have so many things going on during the week, I cannot commit to a standard type class where you sign-up and have to be somewhere at a certain time and can't miss a class. The classes at Craftsy are online and are "self-paced". You can access them anytime from anywhere (as long as you have an internet connected computer or mobile device available) and you can always pick-up where you left off, no matter how long it has been. Access to your class never expires! I recently enrolled in the class "Sewing Machine 911" with Claudia Miller and even though I had some experience sewing, found this class extremely helpful in getting me back up to speed! I have found so many fun classes I want to take now that I have sampled one. Here is the top three on my wish list! 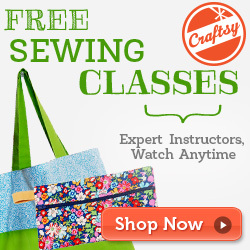 Check out all of the other great Craftsy Classes by clicking here. *(Note: In the interest of Disclosure and IAW FTC 16 CFR Part 255: I am an affiliate for Craftsy and therefore make a small commission on purchases made using the code and the link in this post and from the ad on my sidebar. I was paid a small fee for this post. So excited to be co-hosting this hop! Come along and join in the fun and meet new friends on Facebook, Twitter & Pinterest! 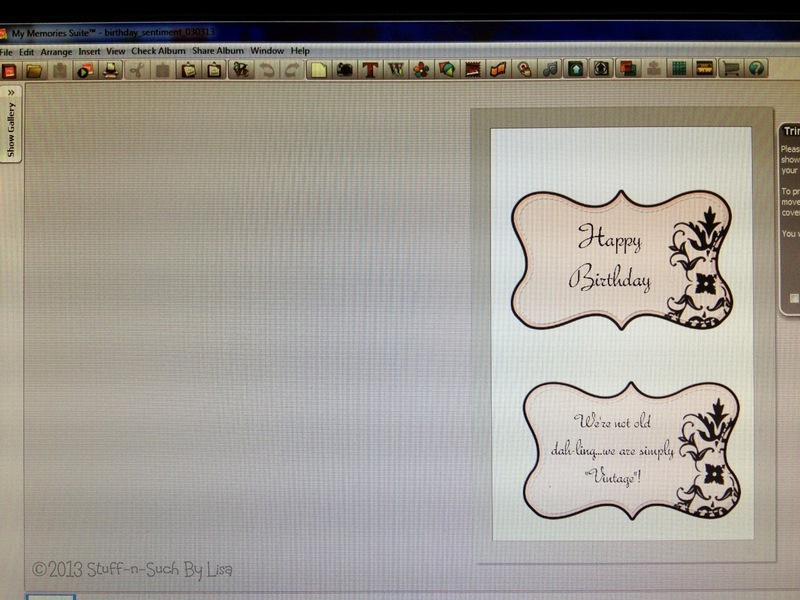 Have I mentioned lately how much I LOVE my digital scrapbooking software??!! Recently, I discovered another fun way to use it and that is to make Facebook goodies. Not only can you make amazing timeline covers, but when it comes time to celebrate someone in your life, you can make some gorgeous tribute pages/layouts and post them on the day your are celebrating this special individual! 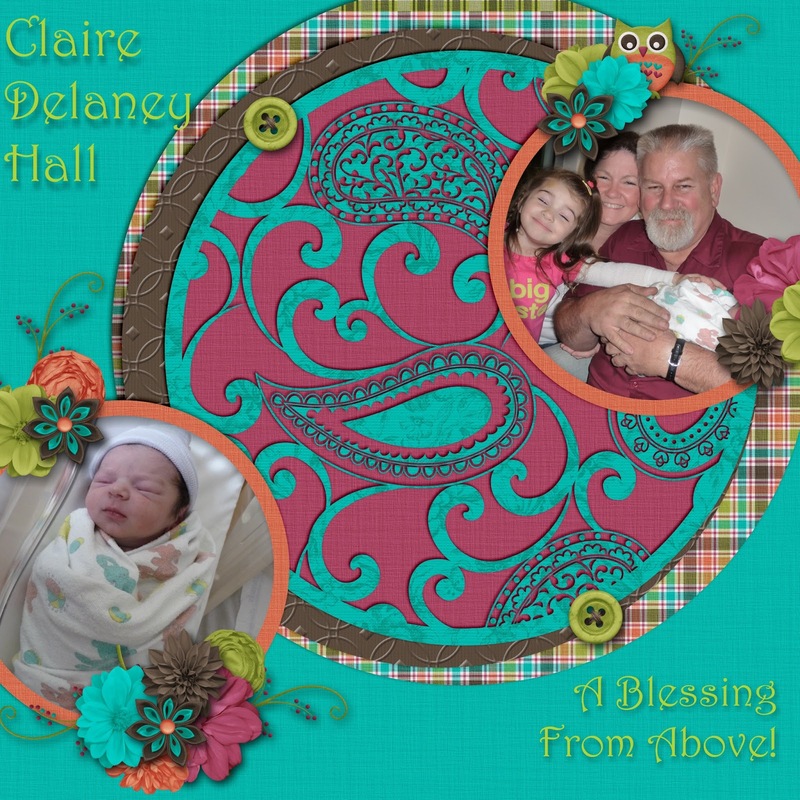 My sweet Granddaughter "C-Bear" (as we affectionately call her! ), just celebrated her second birthday and of course Gramma (aka: Gigi Lisa) could not let the day go by without letting her entire Social Network know about it! The best part is, I created both of these layouts in less than 20 minutes and the first one was a "Quick Page" template that took only a matter of minutes! I rarely get so excited about a product, but this software is just so amazing and easy to use! The software comes with lots of background designs, embellishments and tools to make amazing scrapbook pages, cards, invitations or anything else you can imagine. 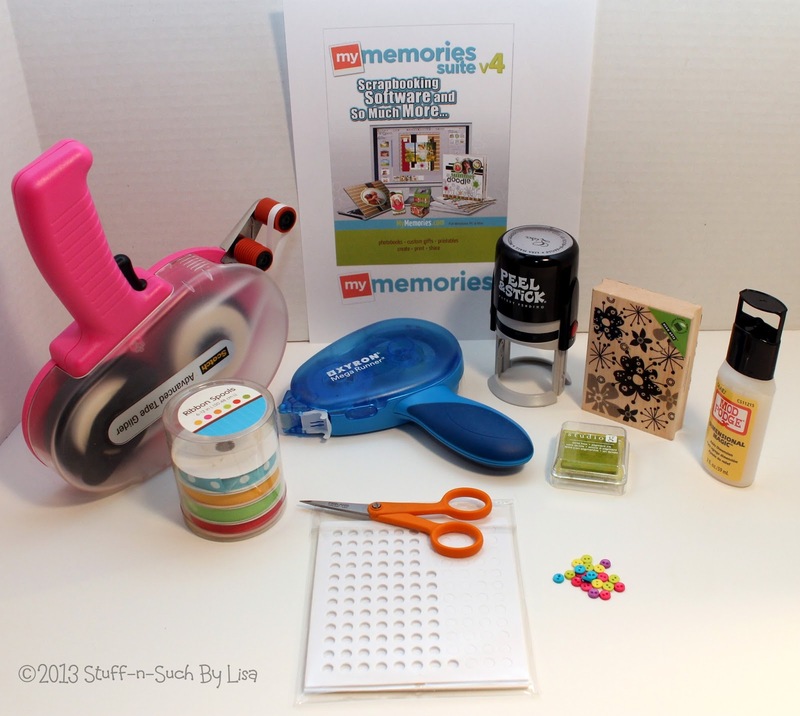 In addition, on their website there are a plethora of "freebies" and low cost kits that will get you excited to scrapbook and create! So happy you could join me today...hope you liked my project and I would love it if you left me a comment! *(Note: In the interest of Disclosure and IAW FTC 16 CFR Part 255: I am an affiliate for Making Memories and therefore make a small commission on purchases made using the code and the link in their ad on my sidebar. I was not paid for this post or any other post containing reference to their product. I was originally given one copy of their software to review. 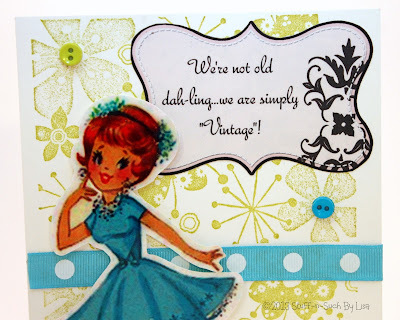 Today I want to share with you a birthday card I made for my friend Melissa. 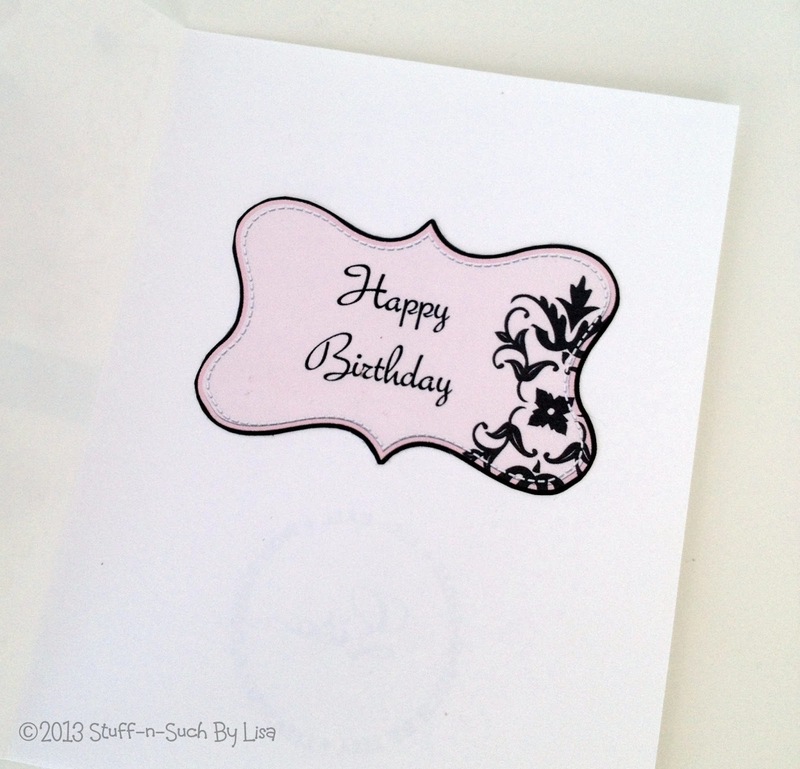 I was running short on time and had to make this card rather quickly which led me to think of other ways to embellish the card rather than use my Cricut machine. Not that I don't love my Cricut machine mind you… But when I'm limited on time and space sometimes it's just easier to do without it. 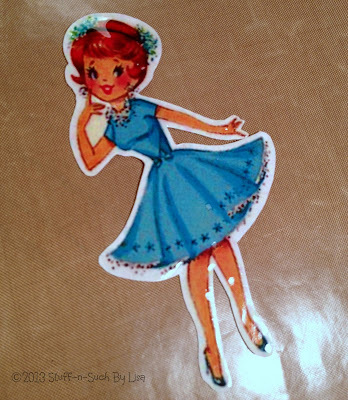 I found this adorable graphic of this vintage lady from Keren at "Free Pretty Things For You". Her blog is just a delight! 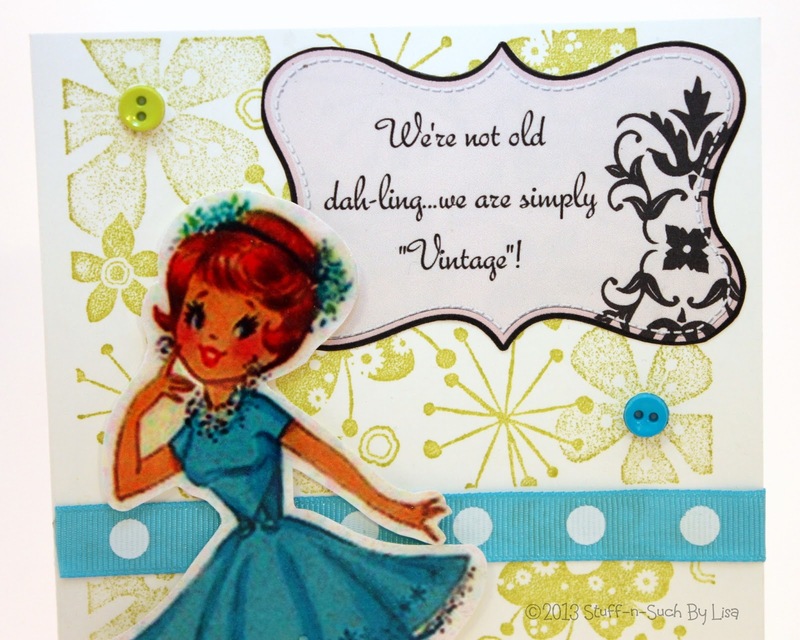 So many pretty, vintage goodies and many of them are free for personal use. Check out her site if you get a chance...you won't be disappointed, I promise! I had downloaded the graphic from her site, quite awhile ago and was just waiting for the perfect project to use it in. I knew this would be the right time to use this sweet lady, as my friend Melissa likes vintage things and her son even plays in a band called The Vintage Vandals! (They are GOOD...you can check them out here). I used a medium weight white card stock (110 lb.) 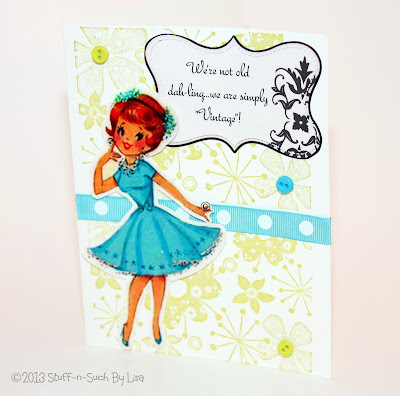 to make this card and stamped it with a flowered background stamp from hero arts using an olive green pigment ink stamp from Studio G.
I really felt that the pattern and color on the stamp was reminiscent of vintage 50's decor...almost like wallpaper you would have seen back then! 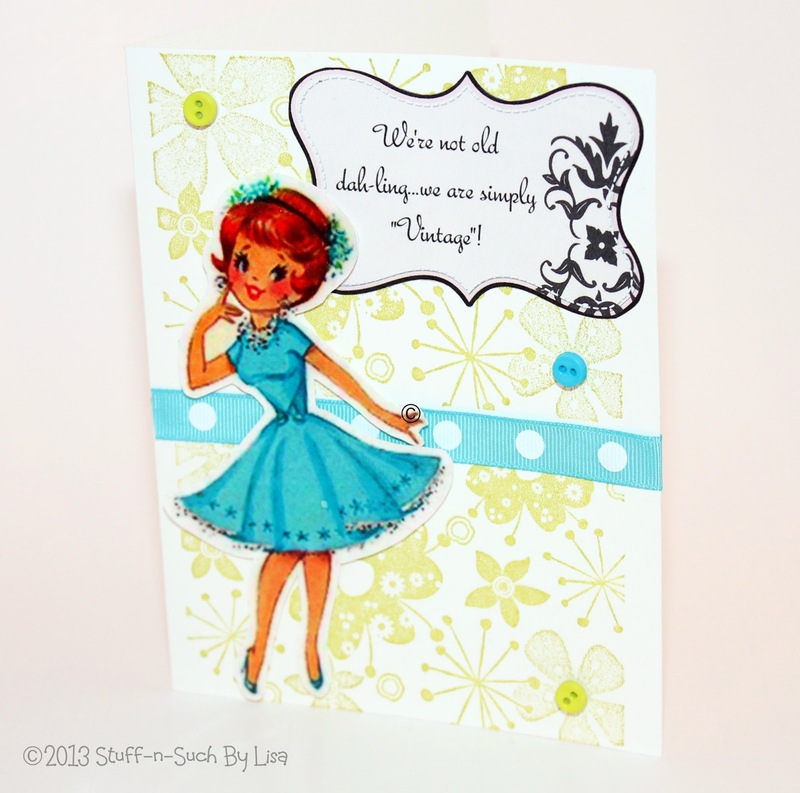 The pretty vintage girl from FPTFY was printed on the same cardstock using my Lexmark Printer. I cut her out and added some Mod Podge Dimensional Magic to make her shine! 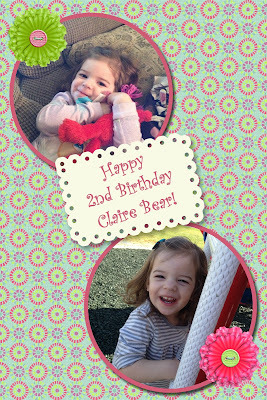 Then, I affixed her to the card using some foam adhesive dots to give her some more dimension. I created the word sentiment myself as I could not find any on the Internet that I felt worked for the type card it was. The journaling frames/shapes (inside and out of the card) were made using My Memories v4 Digital Scrapbooking Software. 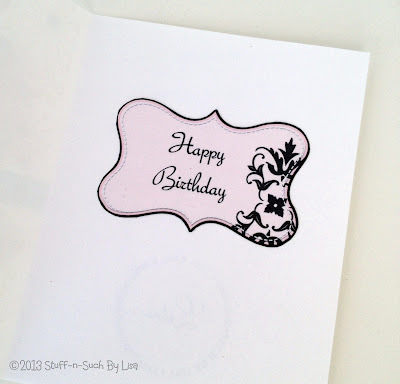 The journal frames were a part of a Birthday Kit I had purchased called "Birthdays and Many More" and the embellishment was called "Journaling Pink". The sentiments were made using the MyMemories Software and I used the font: Bella Donna. I printed these embellishments out on some cardstock and then I cut them out. I added the polka-dot ribbon and tiny button embellishments to add an extra pop of color and dimension. 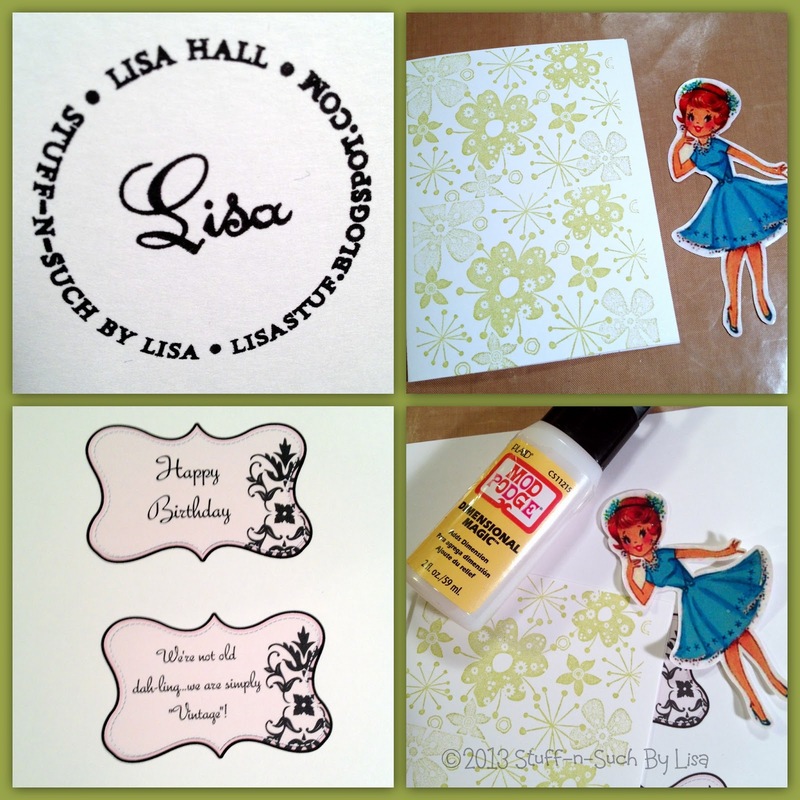 The final touch was to add my personalized blog stamp (PSA Essentials Peel and Stick), to the back of the card and it was ready to fly! White Card Stock, GP ImagePlus, 110 lb. Flower Patterned Rubber Stamp, Hero Arts, #K5346 (2010) "Flower Burst Card"
Thank-you for stopping by and checking out my card! I would love it if you became a follower and let me know what you think by leaving a comment!